Rhineland Palatinate is making serious efforts in tourism. 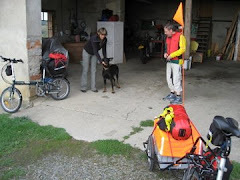 Various companies in the south of the province along the 200km or so Weinstraße (Wine Road) from Bockenheim north West of Worms to the French border at Wissembourg (Alsace) are offering services to cyclists and walkers that we feel are worth knowing about. You can lock your bike up to go for a swim or an ice cream without having to lug your bikes with you or worrying that some rustler is going to steal the bags. You also don't have to find someone to look after your gear. You can buy something along the route and have sent with you without having to carry it. Personally I am not too sure if this is a disadvantage, because not being able to carry the stuff means it is possible to avoid buying a case of wine at a vineyard. It strikes me as well if you are going cycling for a week or so as part of a grand European tour, you may well have more gear. This service could be useful. The company also rents out touring bikes.